How our camera exposes our character and story. When we set down to design Vegas Prime Retrograde, we wanted a look and feel that didn’t just create a window into the game and that wasn’t merely a component of gameplay. We were working with a very rich environment with lots of lore and characters that played in stark contrast to the world around them. We wanted our look and feel to give those experiences to the player abstractly. We wanted to bring the literary technique of “show, don’t tell” to our video game with a dramatic and abstract visual experience. In Vegas Prime Retrograde, you see the world through the eyes of Clara, a member of a deep space resource mining team set in the not-too-distant future. Vegas Prime is generally considered a Utopia, but Clara has experienced brain burn, a rare condition from a technological malfunction in her stasis unit, and she returns having difficulty reintegrating into society. For her, the utopian ideals of Vegas Prime are in retrograde. 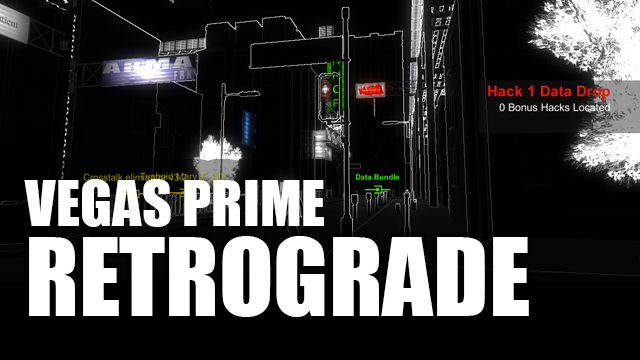 The look and feel of Vegas Prime Retrograde are specifically part of *that* story-telling. We knew the look had to be dark. It had to play in contrast to the narrative of Vegas Prime, which is relatively positive. For Clara, the utopian qualities of Vegas Prime are hard to see, almost like memories of what it was before her brain-burn. We wanted to use black and white, an homage to its comic book origins, but decided to invert the colors -- black with sharp, white outlines. The details fade into the background. It conveys the coldness of Clara’s experiences. A shroud of darkness. We use moments of brilliant and vibrant color to convey the hopeful part of her personality. The fighter that doesn’t give up. Light at the end of the tunnel. The advertisements and computer screens that litter the landscapes are vibrant, almost to the point of being sharp. We wanted to show that for Clara, the utopia of others might actually be a harsh reminder of her sacrifice. What we decided on is a high contrast visual environment that allows the player into not only the world, but the character and story. Already bright colors stand out against the black background and our particle effects stand out, pulling the player through the landscape, just like it would Clara. Though the look and feel is unique, it’s not the only game in black and white, something it shares with a handful of indie titles and mainstream games. The end result has a distinct noir feel to it, despite the futuristic content, and is a hat tip to the classic 80s Cyberpunk tabletop roleplaying game that we grew up playing.